"I make bespoke running jackets with an abundance of function for serious distance runners. My goal is to honor the stylish urban people and places in our city by creating keen jacket designs." Before I even tried out my new Vander Jacket, I had the opportunity to connect with the CEO, owner, designer, and custom creator of Vander Jackets, Sarah Vander Neut. That's right - she does it all! I was so very impressed by her that I did something I don't think I've ever done for a review product before, I asked her if I could interview her for my post. As a strong, working woman with dreams and goals, I was inspired by Sarah's drive and passion to make her dreams a reality and her acceptance and willingness to work hard to make it happen. She was such an inspiration to me that I knew her story would encourage you as well. 1. What inspired you to start making jackets? The winter of my first pregnancy. I didn't want to purchase a running jacket, but nothing fit, so I designed and sewed two running jackets on my machine from the Goodwill. That spring I was selling my clothing designs at a flea market, and I sold both of the jackets on a sale rack. They sold so fast! The rest of the day women kept coming to my tent asking if I had more jackets. That was when I realized that I had the ability to produce functional, bespoke athletic jackets. 2. How long have you been making running wear? I made my first two running jackets five years ago. Since that time I have made over 400 running jackets, as well as a lot of weird running gear experiments that are not ready for anyone but my mom to see. 3. Tell us your running story. How did running become a part of your life. What is it about running that keeps you going in that sport? I was born in Eugene, Oregon--track town USA. My parents moved there because my Dad ran for Nike's Athletics West, and headquarters were in Eugene. Dad got third in the Boston marathon just weeks before I was born, but he stopped running for Nike to spend more time with his family when he was at the top of his game: his marathon time was among the ten fastest in the world. Still, he ran local races and I grew up seeing him run. It looked terrible! He was never smiling during a race and he was often grimacing! I knew I didn't need to be a part of something like that. However, my strong desire as a freshman in high school to meet people led me to sign up for cross country and track. I ran my first marathon when I was seventeen. I've been running ever since for maintenance and fun. I keep running because it is the sport that adapts to life changes: In college I ran high miles and marathons. Now, running is a beautiful time of escape and soul exploration. My mileage is lower than it once was, but some day soon I will get to run more again. I like that you can run for free and I like that running is an ancient sport. 4. How do your jackets stand out from the rest? Vander Jacket is not the "running is pain" company, I want it to be the "running is beautiful" company. My jackets are special because I design and sew each one individually, which is normally a luxury that only the 1% experience in clothing options. I invest a lot of time thinking about the fit and function of each jacket. Good fit makes any garment look more beautiful on a person, and it makes for greater function for the runner. When I go for a long run I want pockets to hold all the food and gadgets for me, rather than a bouncy and chafing belt or backpack, so my jackets have an abundance of pockets. Additionally, I use local raw materials, so the footprint of a Vander Jacket is quite small as it is sourced, made, and shipped from within one Colorado community. 5. Being a Wife, a Mom, a daughter, active in your community, small business owner, etc must keep you busy. How do you find the time to keep running and stay active? I try to keep my priorities in check and take it one day at a time. I fit in a run six days a week as best as I can, but sometimes I need to remind myself that people are more important than running. My weekday runs have to be done by 6:30 am, before other family members begin their days. Sometimes I don't get up and I miss my opportunity to run that day, and there are days when someone is up who is supposed to be asleep! It is helpful for me to remember that a ten-mile run and an eleven-mile run are not that different, but that there is a big difference between running one single mile and not running at all. 6. What are your hopes for the future of Vander Jacket? In the future I would like to be out on a run with my husband enjoying the moment together, and just when we think there isn't a single soul on the same trail, a lone runner passes us at a blistering pace wearing one of my running jackets. That would be great! 7. Anything else you'd love for my readers to know? Yes! My Spring 2017 line of jackets arrives online at vanderjacket.com on Saturday the 18th of March. The collection will include four sizes of running jackets for women and men, as well as backpacks. Thanks Sarah for a great interview and for being such an inspiration to so many women! For me, running motivation is huge! I'm not at the point yet where running has become a pleasurable experience. Music has always been one of my passions and taking it along with me on a run is a must. Truth be told, sometimes it's music that keeps me going on a run. One of the first things I noticed and LOVE about my Vander Jacket is the special iPhone or iPod routing hole in the front right side of the jacket that lets me lead my headphone cord up and out of the way helping it to stay secure while I'm running. No more cord flying in my face, no more accidentally pulling my ear bud out while swinging my arms from side to side. I love this feature! These awesome jacket is chock full of bonus features every where you look. The front has deep pockets in the front that are large enough to hold your cell phone or granola bar for the long runs but is also tight fitting at the same time to keep your items from falling out. The left sleeve has an opening for those who want to run with a smartwatch, step-tracker, or if you are like me and have to make sure your back at the house before the husband leaves for work, even a regular watch can be pretty important. The left sleeve also has a thumb hole, and the left shoulder has a zippered pocket to hold your iPod, or another digital device, or even a great place to secure your house keys and Chapstick! Get Running In Your Vander Jacket! One of the things I love about running outside is that, unlike the treadmill that I can jump off of if I get too tired, no matter how tired I am or how much I want to quit, I've gotta keep going because I've got to make it back to my house! In my Vander Jacket not only do I feel comfortable in a material that moves with my body, but I look fantastic as well! The bottom of the jacket fits snuggle over my hips and stays in place. I didn't ride up which means I didn't have to keep up pulling it down. When it's extra cold or windy (or when my hair is a hot mess) I can throw the hood on and zip up the collar for extra warmth. My Vander Jacket also has reflector patches on the front, keeping me safe on those early morning runs if I'm out before the sun comes up. Okay, I'll say it, sometimes now I just want to go running because I want to wear my Vander Jacket! From it's breathable material to it's flexible shape this jacket is the perfect choice for anyone wanting to make an investment in their health and fitness goals this year. The quality of this jacket is unmatched and you will certainly not find something this well made at any of your local sporting good stores. You'll also not find one that is uniquely designed like these jackets, making you stand out and run confident this year. I said it to my husband after my first run in this jacket, "I'm not too hot, I'm not cold, this jacket really is perfect!" Click HERE to Get Running this year in your own Vander Jacket! There's so many unique designs to choose from! Sarah and Vander Jackets are amazing! I'm following Vander Jackets on social media and you will want to make sure you do to! Don't miss out on her latest jacket designs and upcoming new products! 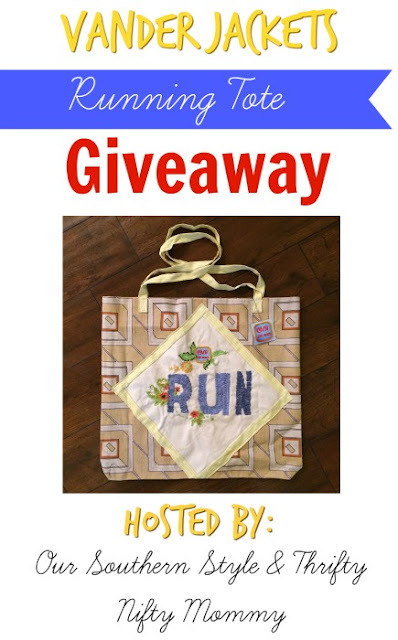 One lucky reader will win this hand-sewn "Run" Tote Bag from Vander Jackets! The giveaway will end January 12th at 11:59pm. Open to residents of the US and must be 18 years or older to enter. Enter using the Giveaway Tools entry form below. Disclosure: I was sent the item listed above at no cost to facilitate this review. Prize fulfillment is the responsibility of Vander Jackets and not Our Southern Style, or Thrifty Nifty Mommy. This giveaway is not associated with Facebook, Twitter, Instagram, or Pinterest. They are designed and individually sewn by the CEO, in Aurora, Colorado. Omgosh I LOVE the amazing mixing of patterns!! I love all the special pockets and add ons!! SO CUTE!! I like that 100% of the fabric is locally sourced but most of all I like the style and patterns. The extras like zipper in shoulder. Nice to have where you can actually reach things ! I like all of the extra's that it has. I like to be able to see my watch without having to move my sleeve. These are cool! If I win one I will give it to my daughter, she is the one that runs. Also, the right sleeve needs to have an opening for those who want to run with a smartwatch, step-tracker. My daughter is left handed so she wears hers on her right wrist. I love the style and colors they come in and all the pockets you can put things into while out walking too.